Giving back to the community where we work and live is important to us. Above and Beyond Delivery believes in community involvement. We love having the ability to donate our personal time and money to charities all around the Phoenix Community. Liz McBride, our Office Manager, said it best – “It’s nice when you can see a direct impact from your annual donations”. We have donated (in partnership with one of our customers) 50 turkeys to the Veterans Center in Coolidge, AZ for “Turkey Tuesday”. 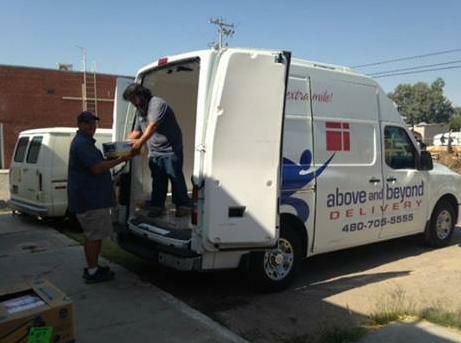 Above and Beyond Delivery now provides the refrigerated truck and delivery service for the United Food Bank’s monthly donation to the Open Hands Veteran’s Center Outreach Program. When Jim asked Executive Director, Diann Hunt, what was one of the more pressing needs at that time, she told him socks. Jim responded with Above and Beyond Delivery donating 500 pair of cotton athletic socks to the outreach program. We will always continue to help worthy organizations when we can. All of our employees feel strongly about community involvement.